This title is directed primarily towards health care professionals outside of the United States. 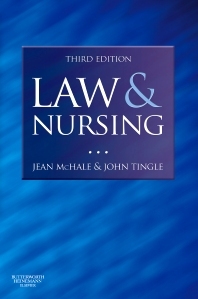 The new and fully updated edition of this leading textbook places law in the context of nursing practice today. Recent developments examined include the Human Tissue Act 2004, which regulates the use of human material for research and transplantation purposes; the Mental Capacity Act 2005, which regulates treatment concerning patients lacking mental capacity; new developments in patient safety and risk management; and the revised NHS patient complaints system.